Each part can have three distinct Part Numbers allocated for you, your supplier and the original manufacturer of the part. Any number of alternate suppliers can be specified for each part, and adding new parts is simplicity itself. 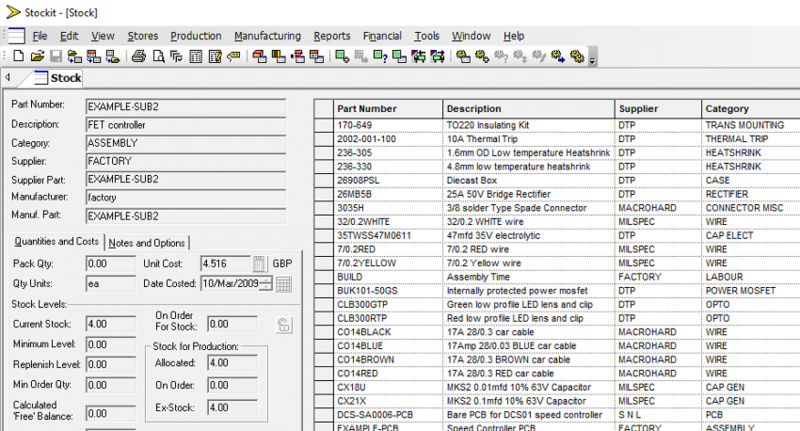 Parts information can be sorted and searched by Part Number, Supplier, Order Code, Location and Category. Information for each part also includes price, minimum and restocking levels, quantity allocated, quantity scheduled, quantity for non-production, units of measure and notes field. All orders can be stored indefinitely on the system and traced back to their original orders if necessary.